I love my life (most days) - Stop staring and start sewing! Yesterday was one of those craptastic days when everything seemed to be going wrong and I'm already waking up stressed so there's not much room for the unexpected in my "patience bank" right now. I'm having pre-vacation "we forgot to get a house sitter, the animals will starve!" type of dreams (even though we have a very capable house sitter coming and I'm sure he'll feed the pets). Then I realized that a fabric order (which was already delayed while we added some fabrics to it) had been sent to the wrong customer's house and I turned into a blubbering mess while the kids ran for cover in any corner they could find. I stomped off to the car because my battery was at Sears being tested (while I use one of their loaner batteries, which I didn't know existed) and I needed to find out if my dead battery was actually bad. They have to charge the dead battery up overnight to test it to see if it's actually bad. Seriously. So I was mumbling "I hate my life, I hate my life" as I left the house. I'm so glad I stopped at the mailbox on my way out. I opened it and there was a package from F W Media addressed to "Stop Staring and Start Sewing" (my blog got a package!). I opened it up and began screaming "I love my life!!" because Kay Whitt's new book was in it and I totally was not expecting it! In fact I've been scanning the local Barnes & Noble's this past week looking for it because I didn't want to order it online and have to wait. Cowabunga! So I was thrilled to have something to read while my battery was being replaced. Yes, it turns out my battery was, indeed bad and I did a halfway decent job of not sounding too sarcastic when I said "You don't say!" to the mechanic who gave me the news. Did I mention we just spent 600.00 on 4 new tires and some struts (which are like shocks I guess)? I need one of those "Keep Calm and Carry On" posters right now. Anyway, enough about my car woes! This book is PERFECT!! 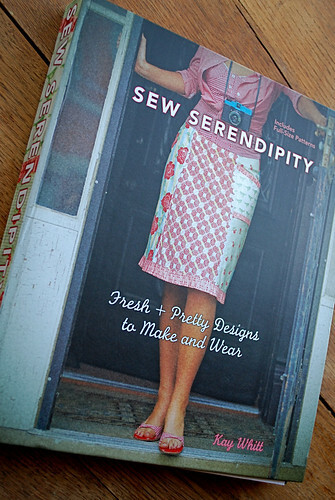 You know I love Kay's patterns so this book is just a slice of sewing heaven. It's so cute I'm going to go buy a coffee table just so I have a place to display it. It's a hard cover but spiral bound so it opens and lays flat so nicely. I LOVE the fact that she shows her initial sketch with each project so you can kind of see the evolution of an idea here. 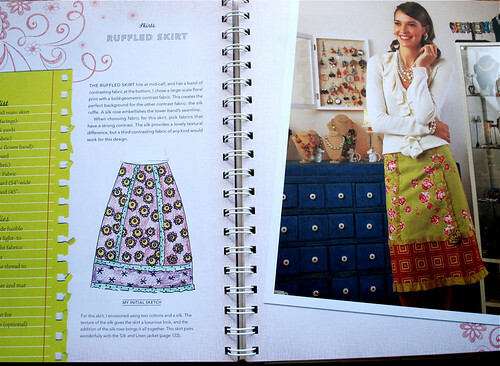 I must make this skirt very soon. I must make this skirt too. I actually have some of these fabrics still. Truth be told, I have a habit of stashing some of my favorite fabrics especially if I find out they're going out of print (I don't want my customers to think I'm holding out on them but seriously, who wouldn't do that?). 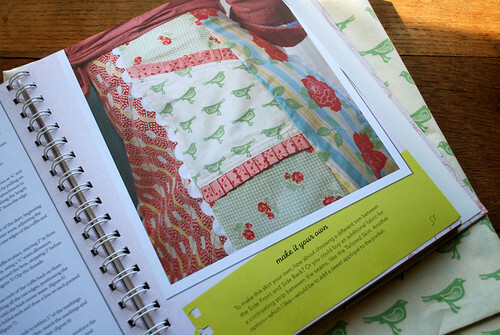 But you could use all sort of fabric combinations (sorry, don't bother asking for my bird fabric!) with these patterns and come out with some drop dead gorgeous items. I'm determined to make one of the oh-so-smashing jackets this year. I cannot recommend this book enough and if you go over to Kay's site now you can buy a signed copy from her (and it's marked down so don't wait). But first sign up for her give-away here! Oh, and all the instructions are hand drawn and they are darling (see Kay explain it to BariJ in an interview at Boutique Cafe). This book will keep you busy and looking good for a long time! Oh! The winner of the last drawing is Steph who left a comment at 1:40 on June 14th. Congratulations Steph! I'm going to start the give aways again when I'm back from vacation. I have one more (super cute!) skirt tutorial coming up and Olivia is working on some super cute things I'll share. I hope you're having a great week!